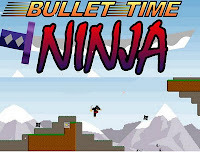 Bullet Time Ninja is an action platform pixel physics game from kwarp. You play here as an awesome ninja that has the power to slow down time like Max Payne but more fantastic because you can also dash through the air at supersonic speed. Using these abilities, conquer every challenge and collect all ancient scrolls or go for the achievements. Control your little ninja with arrow keys for the movement while A key is for focus and S key is for jump or dash. When you hold the focus button, you enter bullet time. Dashing can be done only when mid air and the focus circle is more than two thirds full. There are 20 levels in this little game and I must say that it's pretty challenging. Meanwhile, here is Bullet Time Ninja walkthrough showing all the levels beaten.